Er…no, actually it would be a good time to spend reflective time apart. 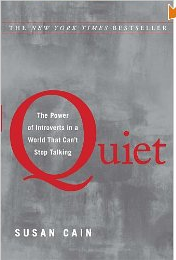 I finally finished Quiet: The Power of Introverts in a World that Can’t Stop Talking. As I read these pieces of advice, I resonated with Susan Cain, her interviewees, and their reflections about navigating career, relationships, and childhood as introverts. Quiet was an interesting foray into the inner world of the introvert. The book challenges the premium that our culture puts upon extroversion, dissects theories of personality, and ends with a section that guides introverts through navigating situations more suited to extroverted characteristics, dialoging with extroverts, and raising introverted children. Overall, the book was fascinating. I talked about it enough that I already have a fellow introvert ready for me to hand it over, so she can read it as well. As an introvert, I found the range of topics within the chapters sometimes frustrating. As an introvert who likes to stop and reflect, it should come as no surprise that there were moments of frustration because I was just settling into a topic when the chapter would end and an entirely new angle of introversion would be examined. And a few times I felt like Cain was stretching the research just a bit to make her point, but these slips were forgivable. At the same time that the frequently shifting topics was at times tiresome, I have to give Cain credit for not repeating herself like some non-fiction works do. This isn’t one of those books that runs on for 150 pages circling around a vapid observation that could have been made in 30 pages. Each chapter brings fresh discoveries. Her hypothesis that our culture has swapped personality for character is thought provoking, and the studies that bring to light the ways in which group work manipulates our perceptions of right and wrong were downright unsettling. Her book is culturally relevant as she hypothesizes the role that extroverted leaders, who remained unchecked by introverted colleagues, played in the recent stock market crash. And any introvert who reads part four of the book, “how to love, how to work,” is sure to pick up some insight about how to approach career and relationships in with a healthier and more balanced approach. Note: This book was provided by Waterbrook/Multnomah’s Blogging for Books program in exchange for my honest review. This entry was posted in what I'm reading and tagged sociology personality. Bookmark the permalink.